Cheer up, Eastern Washington football fans. Three times in the last six years and twice in mid-season, the Eagles have broken in a new quarterback. They came up big every time, with Vernon Adams Jr. in 2012, Jordan West in 2014 and Gage Gubrud last year. All three were thrown into the fire with little experience, and all rose to the occasion in their opening game. More important, the Eagles won them all. Enter Eric Barriere, who will start Saturday in a must-win game at North Dakota following Gubrud’s one-game suspension. The redshirt freshman has spent almost two years in the program, learning the offensive system. Gifted with speed and a big arm, “he has a very high ceiling,” coach Aaron Best said. Other coaches in the Big Sky Conference have long respected Eastern’s offensive system, and by extension their quarterbacks. Perhaps it’s part of the Eagle DNA, but new quarterbacks, even inexperienced ones, have typically thrived. Thrown into the fire, most have burned brighter than ever. In 2012, the Eagles were coming off a 24-20 loss at Washington State. 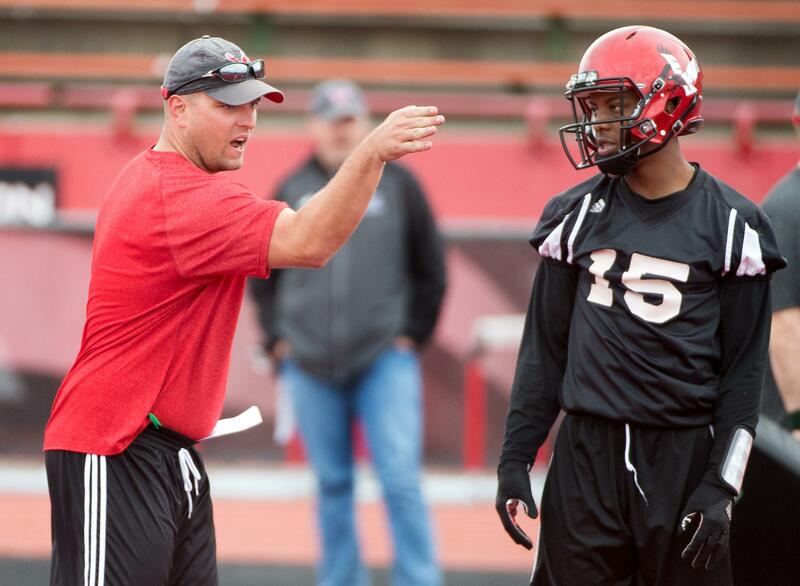 With a bye week to consider his options, former EWU coach Beau Baldwin benched veteran pocket passer Kyle Padron and brought in Adams. A scout player in 2011, Adams never saw the field until that night in Ogden, Utah. His numbers – 7-for-12 passing for 75 yards, and 62 yards rushing – were nothing special. Padron played the second half when Adams suffered cramps. However, Eastern went on to win the game, 32-26, and the Big Sky title. And a star was born. After the Weber State game, Baldwin was all smiles. “I kept that a real secret, didn’t I,” he said. Two years later, change was forced on Baldwin and the Eagles. An All-American by that time, Adams gutted his way through a foot injury in week six, but would miss the next four games. The reins passed to redshirt sophomore Jordan West, who to that point in the season was 7-for-11 for 62 yards. Sure enough, West and the Eagles throttled the Thunderbirds 42-30. They went 3-1 during Adams’ absence, losing only by a point at Northern Arizona, and won another conference title. The Eagles faced an entirely different situation in the 2016 opener at Washington State. Mostly because of his mobility, Gubrud won the starting nod over West and Reilly Hennessey. The previous year, Gubrud was 7-for-13 for 66 yards, most of that coming in a one-sided loss at Montana. The Eagles also were breaking in a new offensive line and running backs, leaving most fans skeptical. Once again, the doubters were wrong. Eastern won the game and another conference title while Gubrud rewrote the record book. Now it’s Barriere’s turn, but this about more than one player. Baldwin said it best in 2014. “It’s like a family, like any tight-knit group – that’s when you find out who you are,” Baldwin said. Published: Nov. 9, 2017, 9:24 p.m.